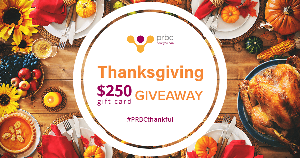 Prize: A $250 gift card for the Thanksgiving feast of your dreams. What you must do to enter: Submit a picture of what you are thankful for, and tell us the story behind it. Make sure you include #PRBCthankful in the caption. One winner will receive a $250 gift card for the Thanksgiving feast.